At Sterling Dental, we want to help each of our patients love their smiles. For patients experiencing tooth loss, Drs. Timothy Lemke and Colin Windom offer treatment to help restore your natural-looking, comfortable smile with dental implants. Are you missing one or all of your teeth? Our Sterling dentists offer surgical dental implant placement. Regular brushing, flossing, and preventive checkups allow some people to maintain their natural smiles for a lifetime. However, sometimes our teeth just can’t keep up with our busy lifestyles! Implant retained dentures can significantly restore the wearer’s quality of life. 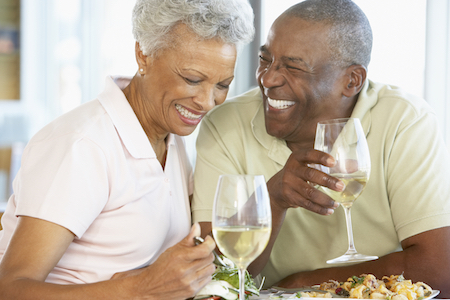 Our Sterling patients can be more confident during their daily activities with the superior chewing and speaking functions our durable implant retained dentures provide. On the day of your surgery, Dr. Lemke or Dr. Windom can install your prosthesis in just one appointment. At Sterling Dental, we offer advanced CEREC technology dental crowns. Drs. Timothy Lemke and Colin Windom can fabricate your crown in just one visit. Schedule Your Dental Implant Consultation With Sterling Family Dental Today! If you have question about dental implants, tooth pain, or any other services Sterling Dental offers, give our office a call. A consultation with Dr. Lemke or Dr. Windom is the perfect way to answer all of your question and determine if dental implants could be the best solution for your smile!